Last year was rich in Christmas sets: Besides the advent calendar ( Christmas's Bakery (3978)), there were also the Nativity Manger (3996) and Three Wise Kings (3997). These last ones became a real MUST for the fan or collector. 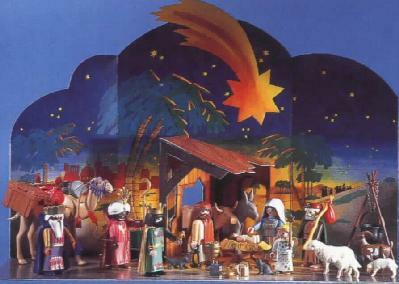 On the right is scene in the side of the Nativity box, showing both sets. Since I have a friend in Germany, I decided to ask her to find them for me... and she did. 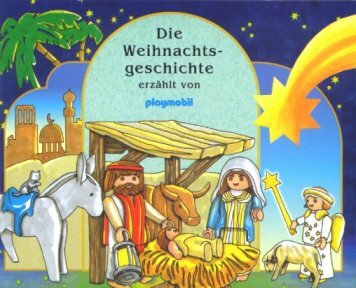 The Nativity Scene, besides the usual instructions, brings a little booklet, with nice drawings and a story. Since it's in German, I decided to only scan the drawings. Hope you enjoy them. 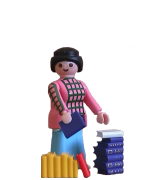 All the figures in these sets are beautifully detailed. The Nativity Scene includes a donkey (with a blue saddle - I haven't seen these since the old Shepherd with Wagon (3412) set) and a bull (an old one, not like the ones in the renewed farm theme). The baby has naked arms (I don't think there were those before), and the woman has the gorgeous hair type that first showed up (as far as I know) in the fairytale theme (though that can't be seen in the pictures) - a VERY pleasant surprise. I believe the baby's "bed" is also unique to this set. The 3 Wisemen sets brings a camel, which is very rare these days. And not only that, also comes with one of those long lost "desert saddles". 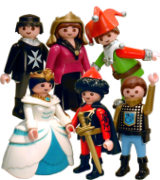 Although I'm quite happy with that, it seems a bit strange that playmobil® decided to include it, since all the kings have skirts, that prevent them from riding. There is a golden trunk and a silver one, and a mystery item with the "green king" (what's that golden thing in his hand?). A possible answer may be frankincense or myrrh (thanks Sylvia!). Finally, this is the drawing on the back cover of the booklet. These sets were later strangely marked as new for September 2000.